Oh wow, there are some things that are hard to keep under wraps! This is something I've been wanting to do for awhile, but I'm so pleased to finally announce a collaboration with Retro 51 to create a Clicky Post exclusive called The System, a space themed version of their popular Tornado series rollerball pen. There are times when I get what seems like a crazy idea in my head for a pen, and luckily it worked out that this one was to become a reality. One of my favorite brands, and one of the earliest "nice pens" I bought was a Retro 51, so I am so thrilled to have been able to work with them on this design. The Solar System is home to all of us and has played such an important role in human civilization. For millennia, our ancestors have looked to the stars and planets for guidance about who we are and where we fit within this crazy existence. I thought it only fitting that such an important and universal part of our lives be translated into something we can carry with us. 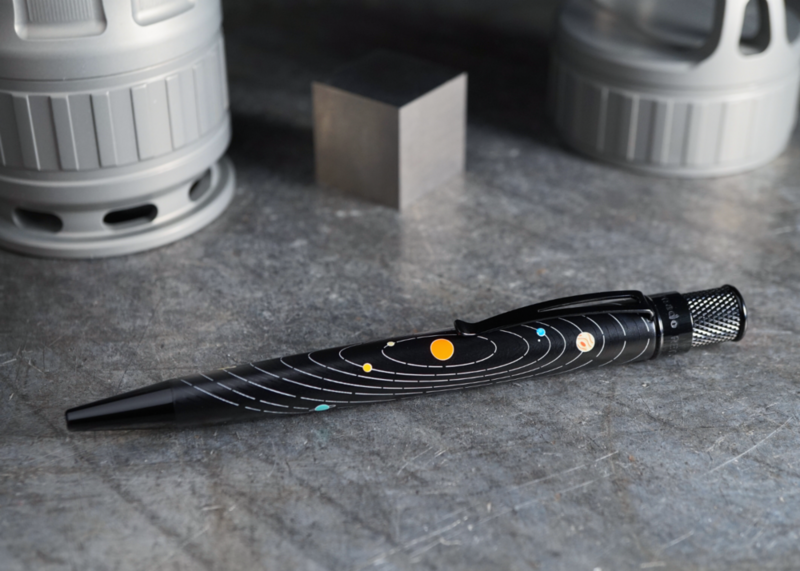 “The System” pen features a matte black barrel with a representation of the planets, each one with either their unique color or features, orbiting the sun on glow in the dark rings. To finish it off, the finial of the pen is adorned with an orange disc representing the sun which adds a nice pop of bright color over the pen's overall dark features. The System is an Open Numbered Edition from 1 - 300 and are now available for pre-order with estimated shipping in early May!